If there’s one thing an excavation can’t do without, it’s archaeologists. Where would any site be without a crack team long-haired, striped-jumper wearing pseudo-academics on hand to break the ground? But when Grimes first dug along the banks of the Walbrook 60 years ago, he and assistant Audrey Williams would have been the only two archaeologists on site, with most of the work being carried out by a team of untrained labourers. How times have changed; archaeologists are now the beating heart of any excavation, doing everything that needs to be done on site to get the archaeology out of the ground. There are a lot of misconceptions about archaeologists (very few of us own bullwhips), with the most criticism coming from those who think the past is best left undisturbed. And we agree; any archaeologist will tell you that the best way to preserve something is to leave it in the ground. Unfortunately, where modern construction and redevelopment are concerned, that is not always possible. When heritage is under threat of destruction, commercial archaeologists are called in to ensure that everything that is removed from the soil is recorded, before the foundations of a new building destroy it forever. With our hi-vi jackets, hard hats and fancy university educations, modern commercial archaeologists neatly bridge the gap between the tweed-suited antiquarians of the past, and the labourers they commanded. Ronan and Sophie have been working with MOLA on the Walbrook for just a few months now. 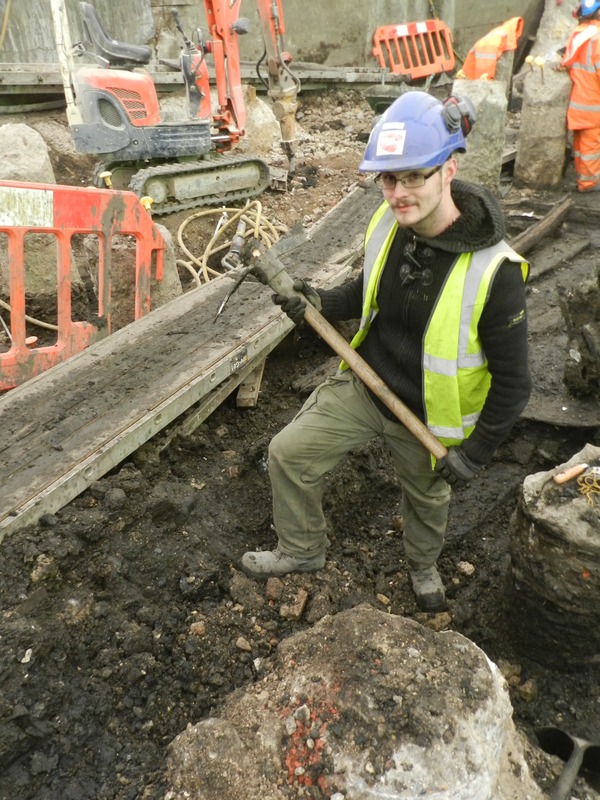 Ronan is in his first year of commercial archaeology, but has already worked on a wide variety of sites, including Roman forts, prehistoric footprints and Iron Age field systems. Commercial archaeologists move around a lot, and when it’s all over here, we simply pick up tools and move on to the next site. Sophie is new to MOLA but not to the profession, having spent three years in commercial archaeology in her native Australia before coming to join us here at Christmas time. Although she focused on Australian archaeology for her Honours degree, her years of field experience mean that she can jump straight in to our team on her first Roman excavation. As commercial excavations can take place anywhere in the country, and range in size from small test trenches to massive open area excavations, flexibility is a key skill. Sasathorn, meanwhile is a familiar face to anyone who has worked at MOLA; she has worked as an archaeologist for 13 years since graduating from the University of Thailand, and has worked on-and-off with MOLA for the last 7 years. 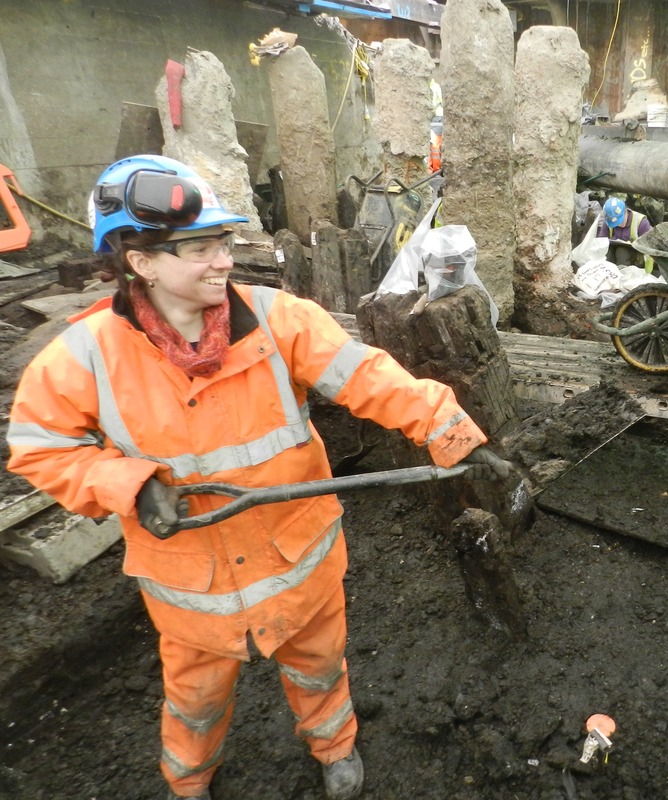 During this time she has worked on a huge number of prestigious sites including Bow Bells House, the Walbrook building, and the Olympic Park, and has become something of a Roman field specialist. As field archaeologists they work in the trenches every day, alongside other archaeologists and construction workers. Although there are 50 archaeologists on site, we mainly dig in small teams of two or three and everyone must be capable of working alone and making their own observations and records. 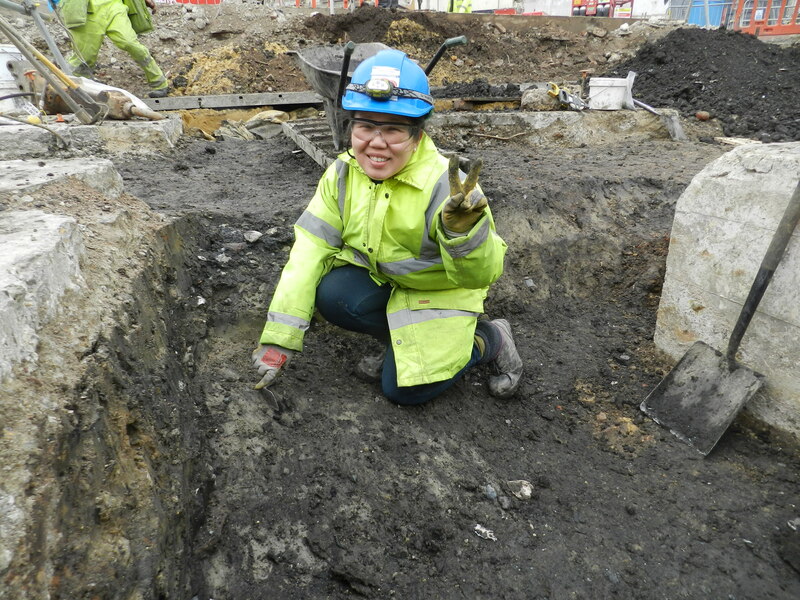 As a more experienced archaeologist, Sasathorn will also work on more small excavations and watching briefs (where an archaeologist monitors construction or demolition work), where she is often the only archaeologist present. Most commercial work takes place on construction sites, so all of our archaeologists have to carry valid safety cards to show that they are aware of the dangers of their work. Hard hats, gloves, goggles and hi-vi clothing are a must at all times, and some areas of our site even require them to wear safety harnesses for emergency trench evacuation. Duties cover everything from barrowing away modern concrete and debris, to careful excavation of fragile bones. Along the way they will create mountains of detailed written paperwork, plans, and timber drawings, uncover bulk finds by the sack-load and shift spoil by the ton (our record so far is 350 barrow-fulls in one day). Everything has to be checked repeatedly and filed away properly, as the records they create will be the only record of what was found here. Whilst doing all this, they even have time to pick up finds as small as your fingernail. A field archaeologist’s lot isn’t easy; the hours are long, the work is hard (and wet), the sites are noisy, dangerous and polluted, and archaeology is one of the lowest paid graduate jobs. So why do they do it? Despite the sometimes miserable weather, everyone says they enjoy working outdoors, and with all this digging to do you don’t need to worry about exercising after work. The real draw for Ronan and Sophie is getting a fresh insight into history; seeing how London developed and changed as you go lower, and reading the material remains left by a largely illiterate population. For Sasathorn, it’s the chance to see new things; as an archaeologist she has travelled the globe, digging in the ancient capitals of Thailand, the crusader port of Saida in the Lebanon, and (thankfully for us) the rich Roman deposits along the Walbrook.